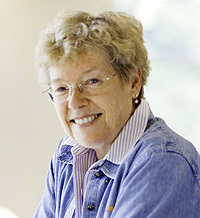 Sandra Faber chairs the Department of Astronomy and Astrophysics. The Department of Astronomy and Astrophysics at UC Santa Cruz has more senior women faculty members (five) than any other astronomy department in the country, according to a recent survey by the American Astronomical Society's Committee on the Status of Women in Astronomy. In terms of the percentage of senior women (tenured professors) on the astronomy faculty, UCSC ranked sixth overall and first among large departments with more than a dozen faculty members. Senior women make up 23.8 percent of UCSC's astronomy faculty, while only 18 percent of American Astronomical Society members are women. "UCSC has been working hard for many years to make our department female-friendly," said Sandra Faber, University Professor and chair of astronomy and astrophysics. Senior women can serve as important mentors and role models for female students. Faber noted that 50 percent of UCSC's astronomy graduate students are now female, which is the second-highest percentage in the country according to a recent survey of astronomy graduate programs by the National Research Council. "Together with our high female faculty numbers, this surely puts UCSC in first place nationally in educating, representing, and catering to female astronomers," Faber said. "Our female astronomers are illustrious at all levels, from senior professors down to the newest graduate students. Our female graduate students have held their own and even slightly outshone their male colleagues in recent years in winning prestigious postdoctoral fellowships upon graduation." The results of the survey were posted on the Women In Astronomy blog.